Solly’s working men’s clubs started springing up all over the country with the help of the WMCIU. Many soon abandoned the teetotal rule as beer was a popular drink and selling it helped to fund club expansion and added to their facilities for members. 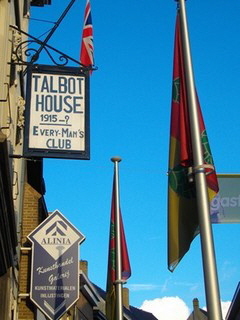 There was a need for a club in Poperinge and Talbot House was soon filling this local need. But now we can understand how it came into existence indirectly through beer and brewing profits- with similarities to the history of working men’s clubs. as newly established clubs were soon affiliating to it. Lt. Col May was passing by when they were preparing the new sign and he stopped his car immediately upon seeing it. He told Neville Talbot that this name would close the club right away, as it would frighten off the very men they wanted to attract. They would continue to use the estaminets instead.